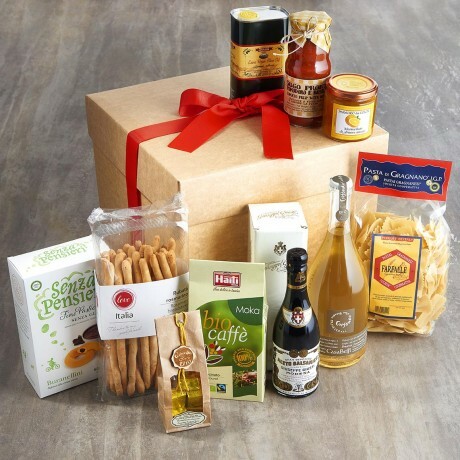 Welcome them to their new home and make that house move a little easier with one of our gorgeous house warming hampers! We’ve included an easy meal for that first night when there’s no food in the cupboards (Farfalle pasta and sauce followed by exquisite hand-made Limoncello chocolates) and a celebratory bottle of our organic Prosecco to enjoy with crunchy savoury breadsticks. For their first breakfast there’s fairtrade Arabica coffee, Italian biscuits to dunk and bitter orange mediterranean marmalade to spread on toast! Tomato Pasta Sauce with Basil (330g) This tomato sauce is combined with fresh basil to give a delicious Mediterranean flavour. Made with all natural ingredients, San Marzano tomato and no added sugar, this is a healthy and tasty addition to any pasta dish! Gragnano Farfalle Pasta (500g) Bronze die cut, dried at low temperatures and made in Gragnano the birthplace of dry pasta, our Pasta Gragnanese Farfalle not only taste better and retain all their goodness when cooked, they also have plenty of surface area to absorb the flavour and liquid of the sauce with which it they are served. One of the prettiest Italian pasta shapes, they resemble bow ties or butterflies and are often served with chunky sauces or in pasta salads. Extra Virgin Olive Oil from Liguria (500ml) This excellent unfiltered cold pressed extra virgin olive oil is made from olives cultivated in this beautiful area of the Italian Riviera, Imperia, known as the olive oil capital of Italy. It comes exclusively from the small, fragrant olives of the “Taggiasca” variety which give a low acidity, golden yellow oil with a delicate flavour. Organic Fairtrade Arabica Coffee (250g) Our coffee blend, made of 100% Arabica coffee by Rome’s favourite coffee company ‘Caffe Haiti’ is both 100% organic and 100% fairtrade. It is strong and full of flavour and ideal for espresso pots, caffettiere and filter coffee machines. Chocolate Filled Burano Biscuits (150g) These delicious chocolate-filled biscuits originate from the beautiful island of Burano in the Venetian Lagoon. Low in fat and carbohydrates and naturally gluten free, they are made with carefully selected ingredients which are all 100% natural. Because of their high nutritional value, these biscuits are recommended for sportsmen and women and in fact Palmisano, the producers are long time sponsors of the Venice Marathon! Rosemary ‘Rubata’ Bread Sticks (150g) Our super-crunchy bread sticks (known in the regional dialect as 'Rubatà' are made in Piemonte from a recipe which is centuries old. Containing extra virgin olive oil and fragrant rosemary, they have been hand rolled and twisted to give them their characteristic irregular shape. These make a healthy and satisfying snack on their own or can be served as an alternative to bread alongside a salad or with antipasti. Dark Chocolates filled with Limoncello Cream (100g) Luxurious Grand Cru dark chocolate (min 75% cocoa) from the Dominican Republic filled with a burst of Mediterranean flavour! This gorgeous gift box contains individually wrapped chocolates filled with a delicious Limoncello cream. Organic Prosecco (750ml) This organic, bio-dynamic, natural, vegan Prosecco DOC has been made in the Veneto region of Italy with traditional farming techniques, completely organic viticulture and very low intervention. Forget fungicides, pesticides, herbicides on the vines, this wine is pure, kind to the planet and very possibly better for your health. All of these products are carefully wrapped and presented in a strong gift box tied with a ribbon. A gift message option is available at the checkout. Please note that if we are out of stock of any item we reserve the right to substitute it with the most similar available item. Allergens: wheat, sulphites, soybeans, milk, butter, whey, sulphites, sesame, eggs, gluten.